See a bigger picture with a genuine Samsung VGA adaptor. Youâ€™ll be able to connect your portable PC to external displays or projectors with this useful VGA dongle. The external display can either be used to extend your network for enhanced multitasking and productivity or it can become your main workspace, offering you a bigger screen and a better view. You can also combine internal and external displays in mirror mode, where both screens display the same picture, which can be very useful when making presentations via a projector. Discover a world of versatile viewing with this powerful VGA adaptor. 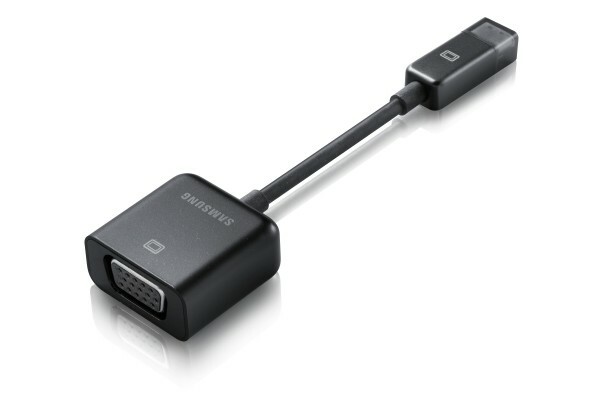 See more of what youâ€™re doing with a Samsung VGA dongle that lets you connect your portable PC to external displays or projectors. So you can use a larger screen as your main workspace or mirror a presentation on internal and external displays for enhanced multitasking and productivity.